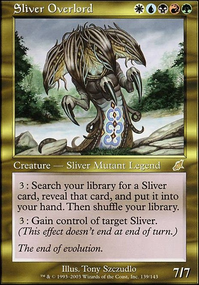 what happens if a sliver loses its type while its activated ability is on the stack? 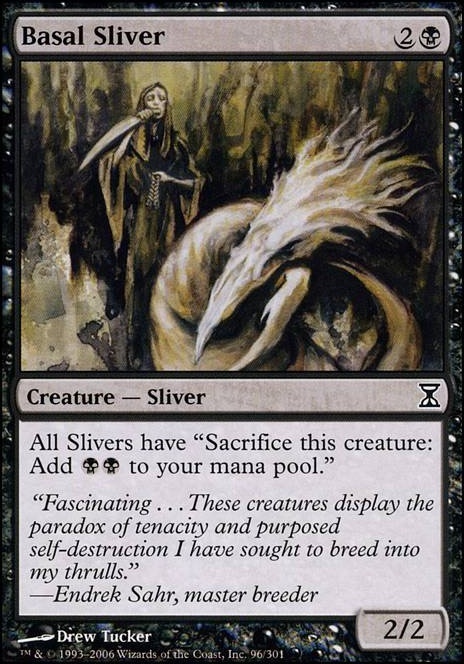 All Slivers have "Sacrifice this permanent: Add (Black)(Black) to your mana pool." I actually built a version of this deck but later changed it to have Jodah helm the deck. I agree with Shagreel but disagree with his selection. 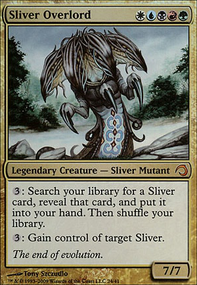 Run slivers that do things, like Gemhide Sliver , Manaweft Sliver , Necrotic Sliver , Harmonic Sliver , Constricting Sliver , Basal Sliver , Darkheart Sliver , or Psionic Sliver . if you are gonna go that route though slipping an Arcane Adaptation and Conspiracy may be worth your while. Also I think there's a bug with your deck page, I can't seem to find Tamiyo, Field Researcher might want to get a mod to take a look at that lol. And was hoping to get some input into any glaring omissions I may have made, as well as any cards which don't need to be there. For reference, the primary combo is Sliver Queen + ( Basal Sliver or Ashnod's Altar or Mana Echoes ) + ( Blood Artist or Impact Tremors ). It's also worth mentioning that I am up against decks like Brago, Najeela, Sisay, OG Teysa, FCT, Kess Twin. 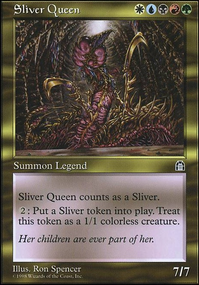 Sliver Queen + Basal Sliver / Ashnod's Altar / Mana Echoes + Impact Tremors / Blood Artist / Zulaport Cutthroat for infinite damage/lifeloss to all opponents. You can also go infinite beats with queen, echoes and Heart Sliver . Why Rhystic Tutor ? Diabolic Tutor or Increasing Ambition gets you the card for sure and it is very cheap. I would pay the to counter your search all day, I really can't imagine someone not paying it, so the or less mana that Rhystic cost doesn't really worth it. Also, there's a card similar to Intruder Alarm that lets slivers combo off, and it's really cheap, Faces of the Past . Goes very well with Basal Sliver . 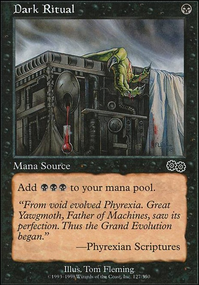 If you're wanting to play combo slivers, you should look into outlet cards like Purphoros, God of the Forge, Impact Tremors, Zulaport Cutthroat and Blood Artist who form a combo with your commander and Basal Sliver, Ashnod's Altar or Mana Echoes (which you should add). Cutthraot and artist don't work with Mana Echoes however are still good enough to run. The other slivers you should look ata running are Dormant Sliver and Necrotic Sliver. You don't need Darkheart Sliver, Ghostflame Sliver, Fungus Sliver or Mistform Sliver. They don't do enough to wanrrant a slot. 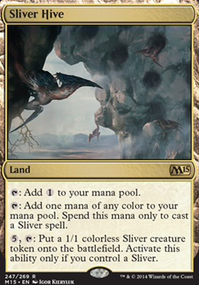 You should however look at including Nature's Lore, Farseek, Skyshroud Claim, Birds of Paradise, Deathrite Shaman (assuming you have fetches) and Noble Hierarch (depending on budget).